Last night Matteo 2.0 my brother Marlon invited me to a movie date. We decided to go check out the bite-size adventures Ant-Man, Marvel's latest addition to their Cinematic Universe, in no small part because I'm a big fan of Paul Rudd (The 40-Year-Old Virgin, This Is 40, Dinner For Schmucks). I had also really liked Ant-Man's Avengers-themed marketing posters, read a favorable review on DTMMR, and was quite curious to see if Marvel could turn another obscure comic-book into a box office hit. When well-meaning thief Scott Lang (Rudd) is released from prison, he tries patching his life back together for the sake of his daughter. Unfortunately, his shoddy past makes it difficult for him to get a job. When his room mate/former cell mate Luis (a very entertaining Michael Peña) learns of a vault at some old dude's house, he suggests that Scott put his thieving skills to good use once more. The old man they're robbing turns out to be Dr. Hank Pym (Michael Douglas), a scientist who used to work for S.H.I.E.L.D. but resigned when he realized they were trying to replicate his Ant-Man shrinking technology. 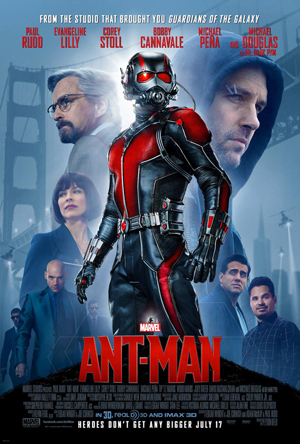 When Pym's daughter Hope (Evangeline Lilly) and his former protégé Darren Cross (Corey Stoll) are close to perfecting a shrinking suit, he decides to take action. As superhero movies keep upping the ante, ridiculously loud and ridiculously big have become the new norm. We hardly expect unpretentious, small-scale heroes anymore. So much so that when Rudd's charming Ant-Man shows up, it's nearly impossible for him to fall through the cracks. With spectacular views of the world in miniature, an interesting and unlikely superhero leading the way, and a lot of funny moments and humor, director Peyton Reed did a great job of producing a 117-minute tribute to "Small is beautiful". Sure, Ant-Man starts slow and doesn't really flesh out its characters, but it still offers an uncomplicated, entertaining and perfectly serviceable superhero experience.